The silver-blue cat with the Thai passport. 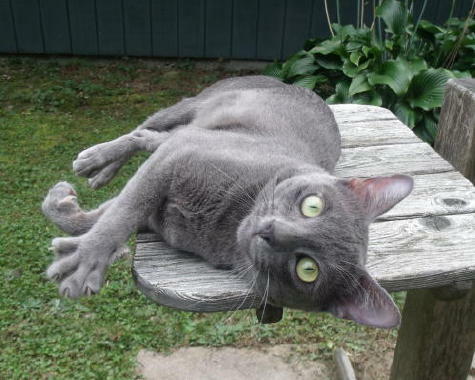 The eyes of the korat are like those of no other cat...as sparkling as the 'dewdrops on a lotus leaf'. As newborn kittens the eyes are blue, changing to amber with a green tinge around the pupil during adolescence, and then, when the cat reaches two to four years, the eyes are luminous green. The roots of the hair are a light bluish color, darkening before the ends become silver-tipped. 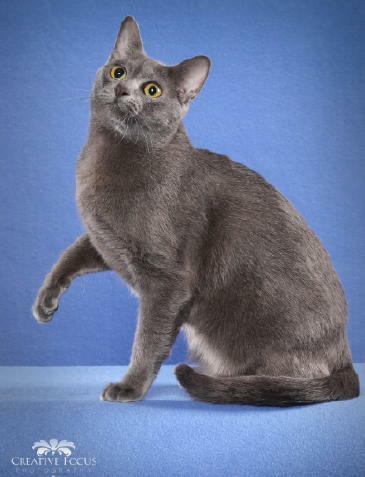 Korats are silver blue from their first day to their last; a cat of any other color is not a Korat. Their coats consist of one layer, without an undercoat and is soft and close-lying. Korats form an exceptionally strong bond of affection with their owners and respond warmly to cuddling. Korats are gentle pets, moving softly and cautiously, disliking sudden, loud or harsh noises. Korats are considered a symbol of good luck by the Thais because according to the Thai tradition they are the color of silver, signifying wealth; they are the color of rain clouds and with eyes the color of young rice, meaning good crops. The gift of a pair of Si-Sawat cats to the bride ensures a fortunate marriage. Following are some pictures and information about our Korats. 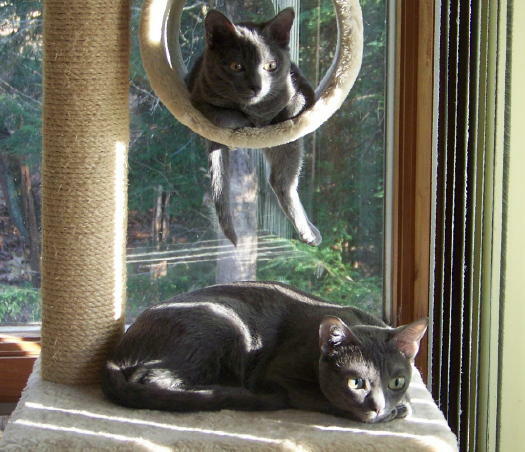 To view Pawpeds Korat pedigrees, click here. Quinn, in the tunnel, and Izabel settling in for the cold winter, getting a few rays of sun. Izabel is my quiet little girl, Quinn just the opposite, she is my outgoing girl. While I was at a cat show I received this photo from my daughter with the caption "Casey is waiting for mommy to come home". She is also waiting for the snow to melt and winter to be over. Casey is 8 years old, still Queen of the house. This photo was taken on 19 January 2019. Casey relaxing on the cat tree in the back yard within the Purr-fect cat fence. Pic taken on 9 July 2015. Casey will be five years old on 25 September. She is my talker, when I say her name she answers me, tells me all about everything. Casey's papa is CH Skarraghbrae J.A.T.O. of Maleza and her mama is CH Maleza Blue Sea Atea. Artemis also relaxing on the outside cat tree, enjoying a nice warm day. A photo of Casey snapped on 11 February 2018 at the Steel City Kitties CFA show at Monroeville, PA. She is seven years old now, still our talker. Here is a photo of Jacob enjoying the warm sunshine, all stretched out, relaxing. Jacob was born 13 February 2017, this photo was taken on 8/29/18. Jacob's papa is GC Gentlegift's Koo Jai of Rebkor and his mama is CH Mysticblue Artemisia Ana. Jacob is a sweet, gentle boy. 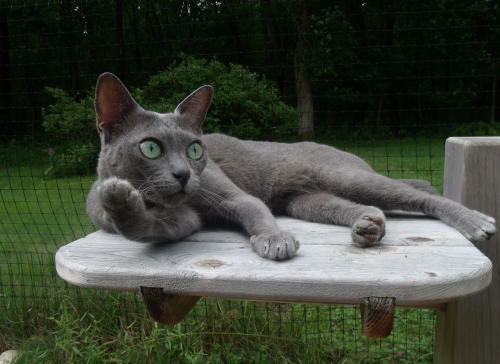 Here is our handsome Korat companion boy. 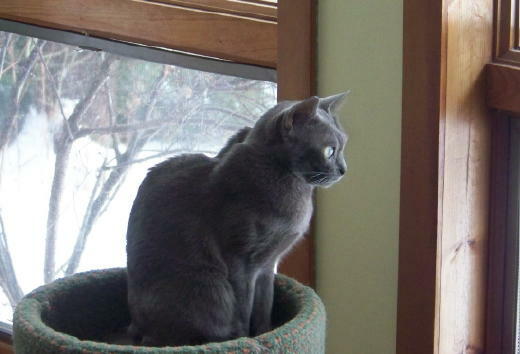 He is RW QGCA Mistyblue Balki, The International Cat Association's Best Korat Alter of The Year for 2012. RW QGCA Balki is also Eighteenth Best Alter of the Year 2012 in the Mid Atlantic Region. 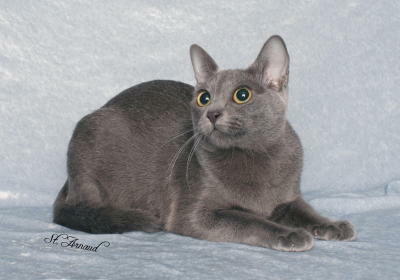 He is GP Best of Breed Premiership Korat in Great Lakes Region, CFA, for show year 2013-2014 and show year 2014-2015. Balki is a delight to have in our home, loves to play, loves his people, he is a wonderful companion. Niobe can certainly be a proud mama. A picture of CH Mysticblue Artemis(cfa) SGC Mistyblue Artemis(tica) taken during the Parma Ohio show by photographer St. Arnaud. She didn't care much for being photographed, she is a bit shy, but very sweet. She kept trying to escape but failed to stop this beautiful photo of her being snapped on 17 January 2010. 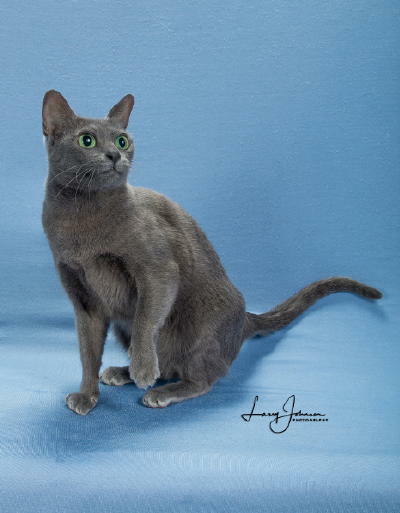 Artemis is Second Best of Breed Korat and Best of Breed Kitten Korat for the CFA show season 2009-2010. Our kittens who go to their new homes as a loving pet are altered (spayed/neutered) before leaving our cattery. Back to our homepage. 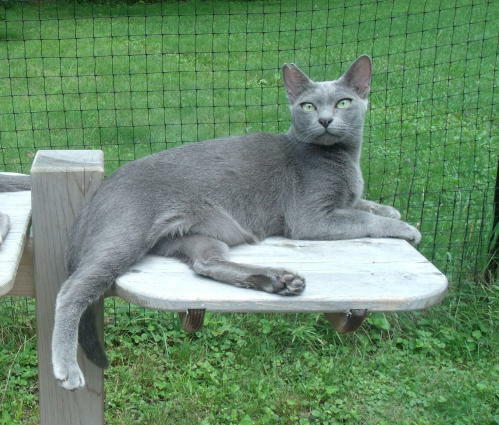 Or view additional pictures of our korat cats. Or view pictures of our companion cats.